Do you have a catch phrase? What about a joke you repeat often? How about a sports chant for your favorite team? These phrases capture your personality and show your friends and family how you think about the world, life, and your friends. If they suddenly were gone or stuck on the tip-of-your-tongue, communicating would be incredibly frustrating and disappointing. That’s where Lingraphica comes in. For years, our speech-generating devices have been helping individuals with communication disorders share their wants and needs. During our three decades of experience, feedback and success stories have poured into our inboxes (digital and literal). Some of this feedback includes making our devices faster, adding more voices, changing the settings that allow for the feedback mechanisms to be turned on and off. Today, after months of coding, we’re answering this call. 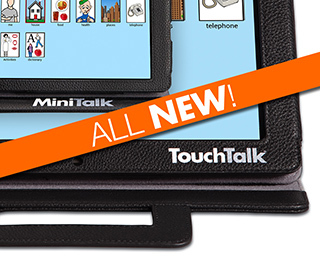 Our TouchTalk and MiniTalk devices are now faster, smarter, easier to navigate, and more customizable. Now you can share the phrases, sentences, and one-liners that capture your personality. If you haven’t seen or used our TouchTalk or MiniTalk in a while, let me tell you about the new features. FastTalk: Our new FastTalk button contains easily accessible words and phrases to help initiate and maintain conversation. The more frequently used messages are stored at the top of the screen, so no scrolling is required. This feature helps users with motor planning and allows for faster access to the words and phrases that matter to the user. Adjustable Settings: Our devices were created for adults with aphasia, and as such had numerous feedback systems built into the communication system. Now, these feedback systems are adjustable, which means users can navigate to the desired icon without the added feedback systems. We also maintained the settings that allow for projection and audio feedback for users who need them. Device Speed: Since we adjusted the settings, the device is much faster. Now the speed of the machine matches the language abilities and skill level of the user. Type and Talk: A new expanded text box allows for users to type and save frequently used messages. Sentences, phrases, paragraphs, shorts stories, and jokes will now fit into the type and talk feature. This enables users to express their personalities more clearly. Variety of Voices: A wide-variety of voice selections are now available. We are pleased to introduce this addition to our devices because it’s another layer of customization for device users. If you are interested in seeing the TouchTalk or MiniTalk device, please call our team at 888-274-2742. As always, we are pleased to send you a device to try for free. Additionally, if you have feedback on the current system, I encourage you to send it to our team. Many of the new features came about as a result of feedback from SLPs and clients. We are grateful for this open communication, and can’t wait to hear more of it!